The American Bar Association will honor former state Supreme Court Chief Justice William S. Richardson with the 2007 Spirit of Excellence Award. The award was established by the ABA's Commission on Racial and Ethnic Diversity in the Profession. Richardson is scheduled to receive his award tomorrow during the ABA Midyear Meeting in Miami, according to a University of Hawaii law school news release. 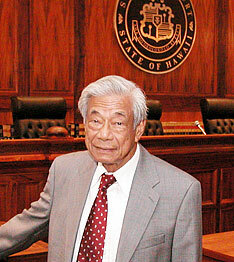 The law school is named after Richardson, the first native Hawaiian chief justice. Honolulu dropped to No. 10 on Men's Fitness Magazine's list of fittest cities in the country after holding the second spot the past two years and No. 1 before that. This year's fittest city, according to the magazine, is Albuquerque, N.M. The ranking appears in the magazine's March issue. In coming up with its admittedly unscientific ranking, the magazine considered factors including how much residents use gym memberships, how much junk food they eat and how much time they spend sitting in traffic. The magazine also said it talked to mayors' offices and city parks departments to find out where people can exercise, programs designed encourage them to be active, and civic leadership. On the other end of the fitness scale is Las Vegas, pegged by the magazine as the fattest city in the country, thanks to its high number of fast-food restaurants and residents' lack of exercise. Keeping Faith: Psychologists and social workers can provide help beyond the scope of the average pastor, but clients may bring their religious beliefs to counseling at one Oahu clinic. The Counseling & Spiritual Care Center of Hawaii has the backing of Buddhist, Catholic, Protestant and Jewish leaders and other faith groups. Today: The 49th Grammy Awards take place Sunday night, and expectations are that there will be many of the usual wild and freaky moments. Mary J. Blige is the front-runner with eight nominations. In the Hawaiian music category are albums by Henry Kapono, Amy Hanaiali'i Gilliom and Ledward Kaapana, as well as two slack-key compilations. Business: Satura Cakes plans a larger cluster of cakeries to sate sweets-seekers and hopes to enhance newly wedded bliss as well. Also in Sunday's Business section, Maui-based investment adviser Barry Hyman was cautious all year on the U.S. stock market but nevertheless posted a 19.5 percent return to beat out five other local experts in the annual Star-Bulletin survey of best investment ideas. Police arrested a 50-year-old man for allegedly stabbing his elderly father early yesterday. At about 12:20 a.m. the suspect was arguing with his younger brother at their home on Makamua Street in Pearl City when the suspect grabbed a knife, police said. Their 76-year-old father intervened, and the suspect allegedly stabbed his father in the forearm, police said. Police arrested him on suspicion of second-degree assault, and the father was treated and released. Fire caused $50,000 damage to a Waipahu home early yesterday. Firefighters were called to 94-125 Hulahe St. at about 5:35 a.m. and found one bedroom in the three-bedroom home on fire, according to Honolulu Fire Department spokesman Capt. Kenison Tejada. Seven adults and four children who live in the home had already evacuated. None were hurt, Tejada said. The residents told firefighters that one of the occupants was awakened by the smell of smoke, saw the fire in the back bedroom and woke up everyone else. The fire was extinguished before 6 a.m. The cause of the fire is under investigation. A 27-year-old prisoner at the Waiawa Correctional Facility was caught Tuesday afternoon after disappearing for one night. Rodney Omar Shere Ness-Rowland, 27, was serving a five-year sentence beginning last May on two counts of promoting dangerous drugs, possessing drug paraphernalia, unauthorized control of a propelled vehicle and driving without a license. At about 6:35 p.m. Monday, he was seen in a restricted area and was told to return to his housing module. A head count later that night showed he was missing, said Louise Kim McCoy, spokeswoman for the Department of Public Safety. The facility is a minimum-security prison. As prison sheriffs were going to the facility to investigate the escape, Ness-Rowland jumped out of the bushes near the Mililani Memorial Mortuary Park just as the sheriffs drove by. He was eligible for parole sometime next year but would now face an additional charge of second-degree escape. A woman who was allegedly driving too slow was arrested in an auto theft case. A patrol officer saw the woman driving below the speed limit in Waianae at about 11:30 Wednesday night. The license plates on the car belonged to another vehicle, police said. The officer then learned that the car had been reported stolen. He arrested the driver, a 24-year-old woman, for investigation of auto theft. Police arrested a 23-year-old man following a routine traffic stop because he was allegedly driving without a license and carrying a gun. At about 3 a.m. Wednesday, the man was pulled over in Kalihi for a traffic violation, police said. He was later arrested for driving without a license. As the officer was gathering the suspect's belongings, he inadvertently grabbed onto the barrel of a gun in the man's bag, police said. He was later also arrested for investigation of a firearm violation. Police are looking for a man who robbed a pizza shop Wednesday afternoon in the Aikahi Park Shopping Plaza. Police said the man entered the Aikahi Pizza Hut Delivery-Carryout store at 25 Kaneohe Bay Drive. The man entered the store, approached the cashier and allegedly pulled out a weapon and demanded money at about 12:45 p.m., police said. The cashier handed cash over to the man, who fled on foot and was possibly picked up by a waiting getaway car, police said. PUHI, Kauai » A former employee was arrested for causing $30,000 in damage to a warehouse. Clifford Medeiros, 23, of Koloa was arrested last week for first-degree arson and second-degree burglary for the Jan. 29 incident at the Fresh Island Fish Co. and for breaking into the property a few weeks before the fire. After posting a $22,000 bail, Medeiros was released. LIHUE » A 30-year-old Koloa man was last seen Dec. 18 after showing up at Lihue Airport for a flight to Honolulu. He never made the flight, and has not been seen since then. Police are asking for the public's help in finding him. Chad Lastimosa, of Filipino descent, is 5 feet 8 inches tall, 190 pounds, and has brown eyes and black hair. He has a tan complexion and a medium build. Police arrested a couple who allegedly tried to hide more than $400 worth of merchandise in their baby stroller, with their baby inside. At about 8:10 p.m. yesterday, a 21-year-old man and 18-year-old woman were seen hiding numerous men's clothing items in their infant's stroller at an Ala Moana Center store, police said. The couple left the store without making any payments, police said. They were later arrested for investigation of second-degree theft.